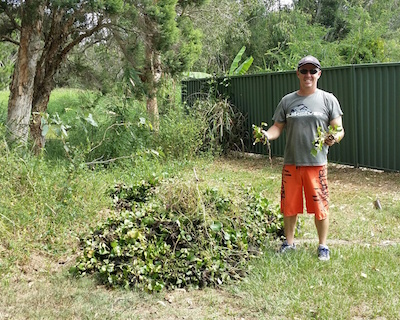 Andrew Walsh pictured with water hyacinth removed from Tingalpa Lagoon as part of school excursion. B4C is very pleased that local environment advocate and educator Andrew Walsh has been awarded in recognition for his environmental work. Federal Member for Bonner, Ross Vasta this month held a ceremony to congratulate the recipients of the inaugural Bonner Volunteer Awards and present them with their awards. Andrew, a teacher at Mt Gravatt High School, has been actively volunteering and supporting community-based sustainability projects for over 14 years. His projects have included partnering Mount Gravatt High School with the Mount Gravatt Environmental Group and B4C. Andrew inspires students to care for their local environment and he has tirelessly given his time to work on projects to reclaim and rectify natural flora and fauna habitats and wildlife corridors. 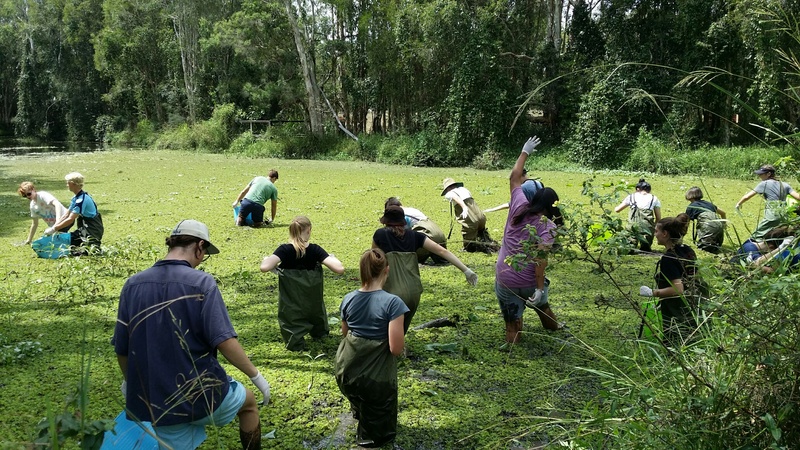 Mt Gravatt High School Year 11 Geography students in Tingalpa Lagoon. An excursion lead by Andrew Walsh and B4C’s Heather Barns. Here they are removing water hyacinth. March 2017. Ross Vasta says the awards are intended to give thanks to individuals and teams that have demonstrated outstanding volunteer qualities. “They recognise volunteers who’ve made a significant and lasting contribution to the community, who’ve set a good example for fellow volunteers and have inspired others to volunteer,” Mr Vasta says. From left to right: Members of Eastern Group SES; Mr Allan Tennent; Federal Member for Bonner, Ross Vasta MP; Mr John Bettenay; Mrs Beryl Acton; Mr Andrew Walsh; and Mr Zac Pankhurst. Andrew Walsh, Mount Gravatt High School, Ross Vasta.